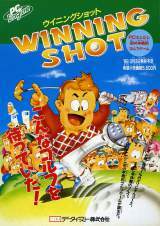 Winning Shot © 1989 Data East Corp.
Winning shot was probably the first golf game released for the PC-Engine. You can either Practice strokes, Match or Tournament. Practice stroke is where you can test clubs and get use to the game. No opponents. Match becomes more interesting, you can play against the computer or against up to 6 players ! In Tournament, as you can guess, must compete in a full Tournement against 11 players. Released on March 03, 1989 in Japan for 5500 Yen.